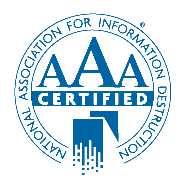 If you run a business, organization, or foundation, the sensitive information you store should be properly destroyed if it’s no longer in use. Every company should implement thorough shredding solutions to protect their business. One of the benefits of establishing a records retention policy is that you can significantly diminish your chances of experiencing a data breach. The purpose of this policy is to define how long your business should store confidential documents or records. Confidential files that are kept after they are no longer needed is not economically sound and it increases data breach exposure risks. Old records can be considered discoverable from a legal and regulatory standpoint as well. It’s wise to manage your documents throughout their entire lifespan. While store-bought shredding machines still offer shredding solutions for small amounts of documents, they don’t compare with professional shredding machines that can handle a higher volume of paper. Store-bought shredding machines can shred a limited amount of paper at once and you must remove the staples and paper clips. There’s also the constant struggle with paper jams and the frequent emptying of the small shred bin. Security experts suggest that paper should always be shredded using a cross-cut method in order to destroyed beyond recognition and most store-bought shredders don’t feature that ability. Choosing data shredding services for the disposal of confidential information. It’s easy to choose a cheaper service provider, but if they don’t follow secure disposal processes, they are putting your confidential information at risk. It’s important to choose an experienced shredding company with a strong reputation and good references. 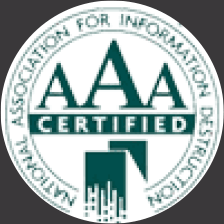 National Association of Information Destruction (NAID) AAA certification will make sure the company you choose is working with the highest ethical and professional standards. A professional shredding service can help you stay in compliance. Avoid legal trouble, help save the environment and obtain peace of mind that you’ve done everything you can to protect the valuable information you store. IntelliShred provides full-service document destruction on site and offers daily, weekly, monthly, service packages. Learn more about our shredding solutions and how we can help you protect your business, contact us today! The Gramm-Leach-Bliley Act, also known as the Financial Services Modernization Act of 1999, was enacted on November 12, 1999 and is an act of the 106th U.S. Congress (1999–2001). This act was established to protect the personal financial information of consumers from neglectful financial institutions. This rule also applies to companies, regardless of whether they are financial institutions, who receive such information. Companies must design, implement and maintain safeguards to protect their customer information. One of the safeguards a company could implement would be putting a shredding policy in place. An established process for handling sensitive information can protect your company from risk of fraud or identity theft. To make it more efficient, companies typically hire a professional shredding company to handle shredding of the mass of paper/documents they generate. With a shredding policy, a shredder service can eliminate any chance that your sensitive information falls into the wrong hands. IntelliShred is an experienced professional shredding service in NJ with years in the business. We can provide you with a custom shredding policy solution that’s efficient and cost-effective! Contact us today!